Successfully Added Wholesale DVB-T Car Antenna to your Shopping Cart. 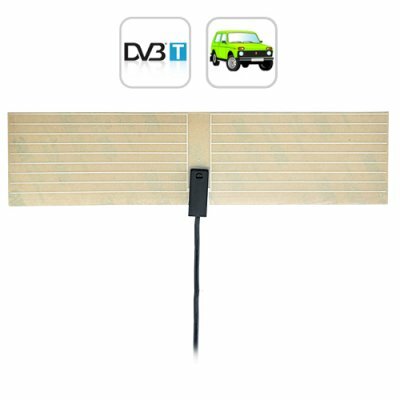 Wholesale DVB-T Car Antenna - An easy, enjoyable, and free way to watch high quality MPEG2 and MPEG4 encoded DVB-T digital TV in your car. This DVB-T Car Antenna receives both MPEG2 and MPEG4 encoded signals and was specially designed to receive free digital TV broadcast signals from major television networks. The omni-directional passive antenna is highly sensitive and can be mounted anywhere for the best TV signal reception in your vehicle. This compact and lightweight DVB-T Car Antenna can be installed on any type of vehicle for an instant and high quality way to receive digital TV in your car. Just stick the antenna part on your windshield (pre-glued for easy installation) and insert the SMA plug connector to any DVB-T receiver, like your Car DVD Player, Portable DVD Player, MP4 player, Headrest Monitor or anything else that has a TV input. Easy stick-on installation means no drilling, no tuning, no annoying cables, no software, no hassle! No, this version does not. However, if you plan on making a bulk order (400+ units), please contact our customer support team and we may be able to accommodate you.